The syllabus is your best bet when it comes to learning how to study for certain classes. Use your syllabus as your course map, because it tells you what is really important. If you have three tests in three different classes one week you can gauge what tests you need to work the hardest in by observing your syllabus. Make sure you keep up with your syllabus throughout the year and look back at it periodically so you can look to see how much that test is worth in the long run versus how much the paper is worth that you’ve been putting off all week. Class time is very valuable to me. I learn about 60 to 80 percent of my information in class. I always pay attention to the teacher and try to keep side distractions like cell phones to a bare minimum. Sometimes I find that thumbing around on a cell phone helps, but only if the teacher is extremely boring! I try to always keep my cell phone out of sight. I jot down notes, but for the most part, I listen to what the teacher says. A “joke” or a real joke that a teacher says may help trigger memory on the test so I always try to take what the teacher says into heavy consideration as I am listening and storing away information. Writing down important information also helps seal in the knowledge into my brain. Writing the information down and listening in class helps me remember it so there is little work for me to do later. Obviously, since I am an oratory learner reading the material aloud helps me study a lot. I actually read really loud in the library once and a girl had to come tap on my study room door to get me to shut up (those things aren’t soundproof?) Obviously this study tip is not the best one if you are studying in a library and people are trying to study around you, but if you are in your room and it helps to hear things for you it’s a good tip. Be careful though because reading aloud can tend to slow you down a bit so sometimes I just narrate in my head and don’t actually speak anything aloud. This one is a little strange, but I found that it really helped me in my History classes. In History classes, you often have to remember a lot about certain events. I would sit with my study guides in the library and make up a colorful dialogue with the history stories. I would consider them stories and fluff them up into more memorable scenes by adding fake dialogue to them in my head. When you do this make sure you are adding in all the facts that you are trying to study into the story because after all you won’t be graded on how well you made up stories. 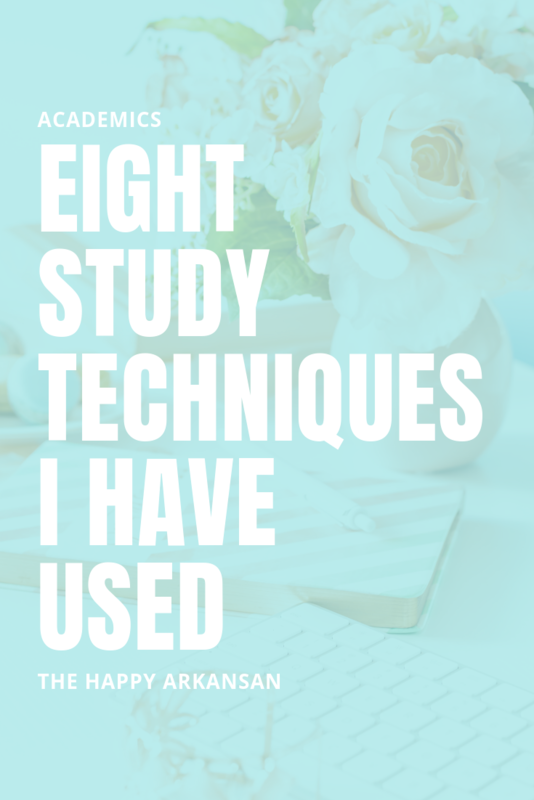 Over the years I have studied my study habits and I have come up with things that just don’t work for me. Index cards are not my friend and neither are all-nighters. I get hand cramps by the time I am writing the twentieth index card and I like my sleep before the test. I also realize that studying right before the test doesn’t help me either. You have the students with their nose stuck to their study guide until their teacher starts to give them the test, but I don’t do that. I put away my study guide well before the test. I’ve found that I can’t really learn anything in ten minutes anyway. I think about happy thoughts or I browse Pinterest. Puppies and dessert recipes are the only things I want to think about right before I delve into a test! If your teacher is kind enough to give you a study guide, use the study guide. If a teacher gives study guides sometimes I will cut back on my reading until I get the study guide, then read only the parts of the book listed on the study guide. It does depend on what type of school you go to, though, because some teachers are a lot sneakier…but you can gauge that once you actually get in class. Being in sync with your teacher has to be an important studying technique. If you are in sync with your teacher you can begin to tell the kinds of things they will likely have on the test. If you know your teacher is a hard question maker you tend to study a little harder for their test. You don’t have to attach at the waist to your teacher, but get to know their personality and reputation and it will give you ideas on how to study for that test. Every summer I browse the web for books to read about learning, studying, and college. I use the summer as my time to learn about learning. Normally I wouldn’t have time to read books about studying when I should be studying but during the summer I have time to brush up on my study techniques. Think of learning as a lifelong experience that can always be brushed up on!